The students at Chadron Primary School attended the afternoon performance of a group of Kenya Acrobats on Friday, November 9th. The students were not only entertained by the acrobats but interacted with the narrator and acrobats by repeating some of their Swahili words and chants. Monday - "Red Day" - Wear as much red clothing as possible; Tuesday, "Roundup Against Drugs: - Wear cowboy/cowgirl clothing; Wednesday - "Put a Scare on Drugs" - Wear a Halloween costume; Thursday - "Sock it to Drugs" - Wear crazy socks; Friday - "Team Up Against Drugs" - Wear sports clothing such as a team jersey or team T-shirt. The students and staff are having a lot of fun dressing up to promote being "Drug Free." The Parent-Teacher Conferences that were held on October 22-23 were well attended by parents of students at the Primary School. The percentage of parents were as follows: Kindergarten - 91% (Mrs. Fisher-88%; Mrs. Hoffman-100%; Ms. Schmid-94%; Mrs. Landreth- 82%); First Grade - 86% (Mrs. Bounous-95%; Mrs. Claussen-88%; Mrs. Ferguson-72%; Mrs. Gardner-90%); Second Grade - 88% (Mrs. Cogdill-85%; Mrs. Hendrickson-95%; Mrs. Hudson-89%; Mrs. Uhing-84%). The Primary Staff very much appreciates the fact that so many of its parents attended the conferences. If you are still needing to conference with one of your children's teachers, please call that teacher at 432-0710 and schedule a conference with them. The Primary School Book Fair generated $2,959 during its displays on October 22 and October 23 during Parent-Teacher Conferences. The money that was collected will purchase approximately 185 books worth $1678 for the Primary School Library. Parents and staff are to be commended for their support and purchases. It is always exciting to see parents and grandparents encourage their children and grandchildren to read by buying them a book. Thank you for helping our students to become great readers. The winners of the Book Fair drawings were Cade Smith, Noah Wirth; Eliana Uhing, Brady Daniels, Trace Shaw, Afton Jimerson, Caden Buskirk, Aiden Dressel, Kyra Kubo, Natalie Carattini, Aspen Graves, Trey Williamson, Kourtney Hawk, Haylee Wild, Kadence Goode, Kyndall Carnahan, Tayton Shaw, Madison Graves, Lauren Rasmussen, and Mason Marcy. Congratulation students. We will look forward to seeing you on Elmo's Float in the Chadron State College Homecoming Parade on Saturday, October 27th. Parent-Teacher Conferences are being held on Monday, October 22, and Tuesday, October 23 at Chadron Primary School. The conferences will begin at 3:00 P.M. and conclude at 7:00 P.M. both of those days. Parents of children whose last names begins with A-L are scheduled to come from 3:00-7:00, and parens of children whose last name begins with M-Z are scheduled to come from 5:00-7:00. 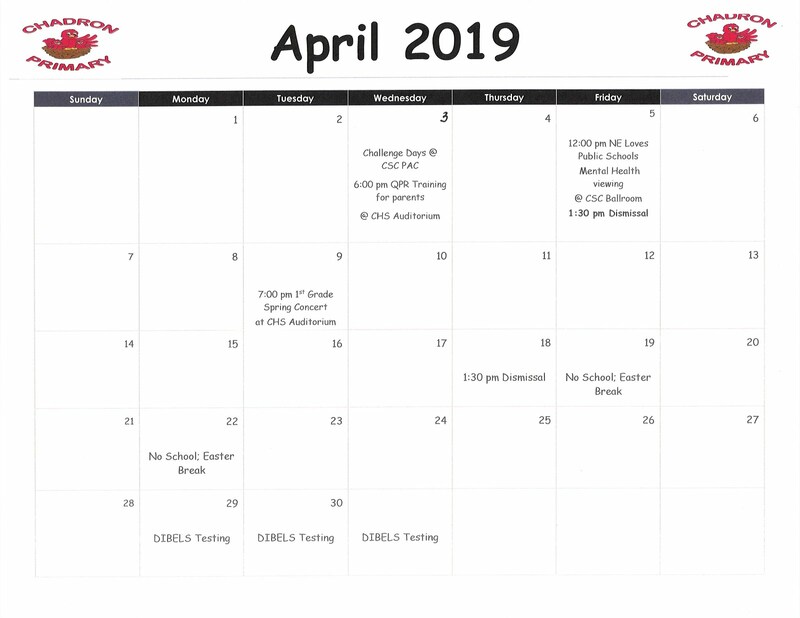 If you cannot make it at the times that we have you scheduled, you may come anytime during the hours 3:00-P.M.-7:00 P.M. Teachers are also willing to schedule conferences, if you cannot come either evening. Several of Chadron Volunteer Firemen gave fire prevention tips to the students at Chadron Primary School on Monday, October 8, during what was designated as "Fire Prevention Week." The firemen who volunteered their afternoon were Bob Tiensvold, Mike Provance, Steven Boeselager, Jack Rhembrandt, Jarret Johnson, and Jason Clark. The fireman displayed three different fire vehicles with equipment and showed the students how the equipment works and allowed them to spray some water. The firemen also let the students hear what a smoke alarm sounds like, discussed how the students can prevent a fire, what students should do in case of a fire, what number students should call in case of an emergency, how to "stop, drop, and roll," the importance of having an evacuation plan, and other relevant information. On Friday, October 5, Chadron State College's mascot Elmo, Mrs. Leslie Bargen from the Alumni Office, and Lindsey Cummings from the Student Alumni Council visited the Primary Building to encourage students to participate in the annual CSC Homecoming Coloring Contest. Mrs. Bargen gave the coloring sheets to classroom teachers who sent them home with their students on Friday, October 5th. The students were encouraged to do their best job coloring and to return the coloring sheets to school no later than Friday, October 12th. The sheets will be judged and the winners will be informed sometime next week. There will be six winners chosen from Chadron Primary Building. Three of them will be Kindergartners and three of them will be from the 1st and 2nd Grade classrooms. The contest winners will win a T-Shirt and will have the opportunity to ride with Elmo on the CSC Homecoming float on Saturday, October 27th. Interim Chadron State Wrestling Coach Brett Hunter brought 26 of his wrestlers to Chadron Primary Building on Friday, September 28, to read to Mrs. Fisher's and Ms. Schmid's Kindergarten students. Coach Hunter, with Mrs. Alcorn's permission, has arranged for a group of CSC Wrestlers to come to Chadron Primary every Friday, when both the schools' and the wrestlers' schedules permit, to read to two of the four Kindergarten classes. According to the Kindergarten teachers, the children had a great time listening to the stories that the CSC students read and look forward to the next time their "Reading Buddies" visit them again. For the Kindergarten students at Chadron Primary School, it is a way to reinforce the importance of reading, and to Coach Hunter and the CSC Wrestlers, it is a great way to give back to the community. Thank you Coach Hunter and CSC Wrestlers. Good luck this season. We will be cheering for all of you! 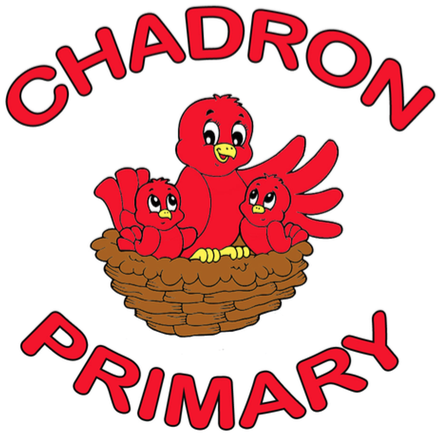 Chadron Primary School started the school year with 218 students. There are 65 students in Kindergarten (Mrs. Kristin Fisher -16; Mrs. Tara Hoffman-16; Mrs. Mikel Landreth-17; Ms. Melissa Schmid-16), 76 students in First Grade (Mrs. Sarah Bounous-20; Mrs. Claussen-Smith-18; Mrs. Gina Ferguson-18; Mrs. Amy Gardner-20, and 77 students in Second Grade (Mrs. Stephanie Cogdill-20; Mrs. Jodi Hendrickson-20; Mrs. Angela Hudson-18; Mrs. Libby Uhing-19). Besides the Kindergarten students who are all new to the Primary Building, our school welcomes 9 students who have moved into the district. Of these new students, Mrs. Claussen-Smith has 3 students; Mrs. Ferguson has 2 students; Mrs. Gardner has 1 student; Mrs. Cogdill has 1 student; and Mrs. Hendrickson has 2 students. We are excited to have so many new faces and are looking forward to getting to know all of the new students. We are also glad to have last year's students back with us. They are doing a fabulous job of following the routines and the rules, and as a result our school year is off to a great start. The Information meeting for parents of potential Kindergarten Students was very successful on the evening of March 13th. The Primary Building had 43 students sign up for Kindergarten for the 2012-13 school year. Tricia Berry, who does the central registering of students in the district, went over the packet of information that was given out to the parents and stressed the importance of getting the information back to her before the beginning of August. Parents of first grade students hosted activities for their children, including siblings, at March Madness at Chadron Primary School on the evening of March 15th from 6:30-8:00 P.M. Members of the Primary Building’s Parent Support Group planned the activities and committee chairs solicited volunteers to help with the activities. The activities included Pop Bottle Ring Toss, Plinko, Bean Bag Toss, Fishing, Face Painting, Basketball, Cookie Decorating, Shamrock Art, Donut on a String, and a Cake Walk. Every child received prizes for their efforts.Not only did the parents plan and volunteer for the activities, they also constructed the games and brought baked items for the Cake Walk. Attendance was over eighty children and over sixty adults.